Venice, Florida — Yes, alligators do swim in salt water. Sharky’s Pier in Venice, Florida is a hot spot for fishing in Southwest Florida. When someone announced seeing a 10 foot alligator swimming near the pier, people gathered to view the unusual sighting. As the alligator swam closer, fishermen jumped into action to try to catch creature. According to one of the witnesses, it appeared as though the fishermen had some kind of shark fishing equipment that ultimately led to landing the animal on the beach. Law enforcement arrived and eventually the Florida Fish and Wildlife Conservation Commission trapped it. “It is not uncommon for alligators to use salt water to transit from freshwater bodies of water,” said FWC Officer Baryl Martin. In case anyone else has this same bright idea, “It is illegal for anyone to harass, or trap an alligator in Florida,” said Martin. 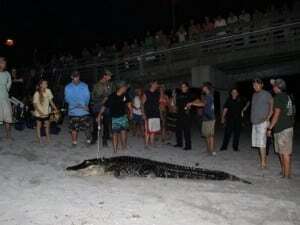 The FWC is investigating what happened and why the fishermen chose to trap the giant alligator. Alligators that the FWC traps that are over four-feet long are typically euthanized and not released back into their habitats. That is a commission policy. The penalty for harassing or trapping an alligator without legal permits is $500 and or 60 days in jail. Click here to learn more information about Florida laws pertaining to endangered species.